The swamp metal trio Black Tusk has forged the unmistakable "Savannah metal sound" into something very much their own. Formed in the winter of 2005, Black Tusk is Athon on bass, Andrew on guitar and James on drums. 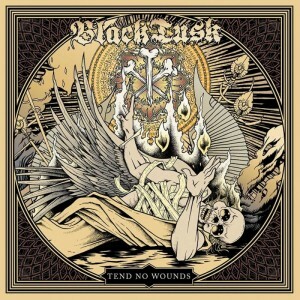 The band's triple-vocal attack is reminiscent of their solid background in punk, but all three members of Black Tusk have deep roots in classic metal and rock. Black Tusk are set to release Set the Dial this Fall. The brand new, Jack Endino (Soundgarden, High On Fire, Skeletonwitch) produced disk is full of non-stop, high-energy hard rock. Set the Dial's ten tracks cook like the Savannah heat, raising up their signature brand of primal, triple-vocal, chromatic madness, and tattooing it across canyon-wide grooves. Black Tusk admit "God's On Vacation" via new video.